In chart analysis techniques, we recognize the term inside bar. Is that inside the bar? "Inside the bar is when the creation of a candle with the body is in the previous candle or called the mother candle. 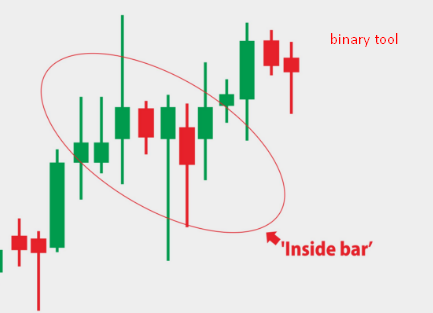 When an inside bar pattern is formed, this is a good moment to take a trading position, "
But the newbie was asked to be more careful, because there were often errors in the use of the inside bar pattern. The inside bar can show a reversal signal (reversal), or trend continuation (continuing trend). Ideally the inside bar pattern is used for daily trading, if the duration is less than that it is very risky. This is what causes most newbie traders to suffer losses due to a rush with a short duration. So that impressed just guessing. Even though according to Wahyu, this pattern can be relied upon to make a profit if the time prediction is right. Also keep in mind that in market conditions sideways inside bar patterns are difficult to use. It's best to avoid it if you don't want to lose profit. An inside bar is best used as a trend continuation pattern. In the daily chart view, this trend can be considered as a game ‘breakout‘. This momentum must be utilized because it can provide a very good potential profit to jump above the current trend market, continue its movement after a short pause or consolidation. Determining the duration of time will be more flexible when market conditions are trending, either bearish or bullish. However, keep avoiding very short durations below the daily. "Our advantage is to use long time, among which we can immediately sell to the market before the duration of time ends if there is a trend change. This is an anticipatory measure to minimize the risk of loss because a good signal when entering a position does not mean that we will be guaranteed 100 percent of profit, often the market acts outside of our analysis, "he added. The candlestick pattern inside the bar is often found at the end of a trend. For this reason, trading inside the bar is often used as a reversal signal or reversal. This candlestick inside the bar indicates market doubt. Take advantage of the strong signal inside the bar to gain profit and avoid mistakes that will cause the strong signal to be in vain.